What are planning to celebrate the Olympics? Make a Flag Handprint Wreath all the resources are available at this link. Children around the world: The Ultimate Class Field Trip. 14 countries are introduced, giving opporunites to explore language and cultures of children across the globe. Students keep journals of their travels and collect flags and pictures of traditional dress. This resource is loaded with cross-curricular activities. A globe is always a valuable resource to have when discussing countries around the world. It helps us realize how little we are! Hold a mini-Olympics Party. This lovely party included athletics activities and treats. Hold your on field day or mini Olympics. This Field Day Mini Kit contains batons, hurdles, cones, and egg and spoon sets. 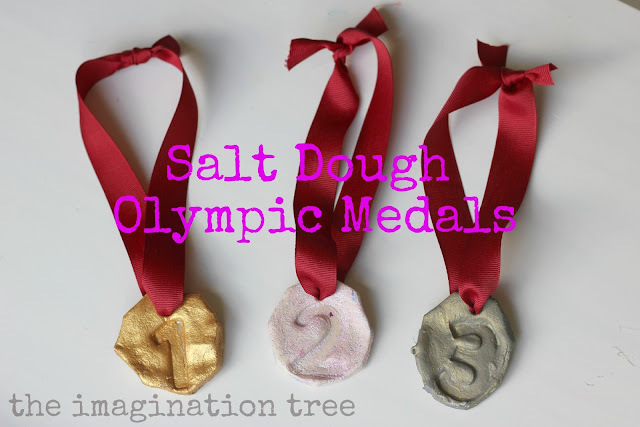 Make your own Olympic medals from salt dough or self hardening clay. The fun, easy-to-do art activities in this resource book, help children appreciate people and cultures from all over the world. Direct concrete experience making art and crafts make geography, culture and history real. Around the World Paper Collection, perfect for a multitude of beautiful ethnic and traditional crafts. Includes African, Native American, Asian, Hispanic, Middle Eastern and Down Under. Make Olympic Flags and discuss the significance on the five rings. What ever you chose to do to celebrate the 2012 Olympic Games, have fun!